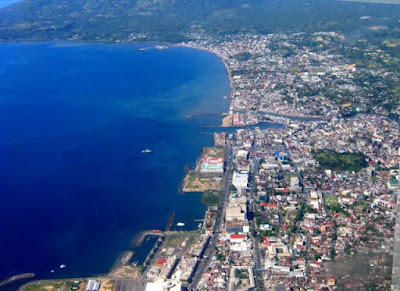 Discover Manado, Indonesia - Manado city is the second largest island on Sulawesi Island. This capital city of the North Sulawesi is one of toursim objects with an incredible undersea view in Indonesia. The uniqueness of awesome scenery in this place is more complete with the big mountain landscape. Bunaken Marine Park is the most popular place in Manado. It can be reached in 30 minutes by speedboat. The beauty of Bunaken Marine Park is no more doubted. Besides that, there is also Tangkoko Marine Park. In this area with a width of 8.718 hectares, you can find the smallest monkey in the world called Tangkasi or Tarsius (Tarsius spectrum) and the exclusive animal from Sulawesi. When you’re walking around the Manado city, you’ll find churches almost in every corner of the city. The biggest Jesus statue in Asia is located in the Citraland Resident area and can be seen from the most part of Manado city. This Jesus statue is the second biggest statue in the world after the one in Rio de Janeiro Brazil. Manado is also a paradise for the food lovers. A lot of favorite food stands located along the main road of Pierre Tendean or in Tino. The foods in this place are still fresh because it is directly imported from the sea or mountain. Baked-fish with special sauce is the favorite menu, combined with fresh and crispy leafy vegetables. One of the favorite foods is Manado porridge and Tinu’tuan. Manado natural splendor has been managed very well at least in the last two decades. Stunning natural charm also has become an interesting backdrop for conventions, events and international meetings. Manado is now slowly but surely becoming one of the leading MICE destinations in Indonesia. In 2008, Manado was the host of the World Ocean Conference, a prestigious international event which made Manado was not only a world-class diving destination but only a research center of marine science. In addition, in 2012 this city became a place where international convention of ASEAN Tourism Forum (ATF) was held. Manado Convention Centre is the main convention place in this city. It offers various choices of special rooms and very ideal for company convention and exhibition. A lot of starry hotels completed by meetings and convention facilities in Manado. If you prepare a long holiday, you can visit some amazing tourism objects around Manado. You can visit Kima Atas Waterfall, Malayang beach, Siladen Island, The old Manado (the biggest island in the border of Manado Bay), Tumbak (a hidden tourism paradise in the Southeast Minahasa), Lihaga Island (a small uninhabited island with very soft and white sands). The access to the Manado city is very easy. SilkAir is the first international airline that flies directly from Singapura to the Sam Ratulangi International Airport in Manado. Besides that, the domestic flight also flies to Manado every day from some big cities like Jakarta, Surabaya, Bali, Makassar, Papua and Balikpapan. Bunaken Marine Park was built in 1991 and one of the first marine parks in the world. It is located in Manado Bay, the north part of Sulawesi Island, Indonesia. It takes time approximately 40 minutes to get to this beautiful marine park by motor boat. Bunaken was becoming a world heritage site after it is listed by Indonesia in UNESCO in 2005. Every year the increasing number of tourists is increasing. You can explore this island by foot or boat to move from one place to others. If you like scuba-diving, this place is one of the best places in Indonesia to satisfy your passion. In this marine park with a width of 808 km2, you’ll be amused by seeing various awesome sea-worlds. You also can see a lot of marine life clearly. Treat your eyes to enjoy the amazing charm of the 13 species of corals and 91 species of fish in the Bunaken Marine Park. Besides that, the underwater park of Bunaken also have molluscs like giant clams (Tridacna gigas), goat fish head (Cassis cornuta), nautilus (Nautilus pompillius), and tunikates. 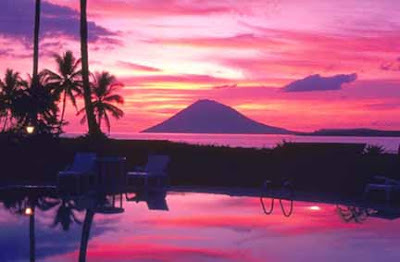 May to August is the best period to visit the Bunaken Marine Park. During that period, you can explore the whole of this beautiful marine park. You will feel the thrill of diving with a dish of fascinating underwater scenery in the park is located 75 nautical miles from Manado Beach. The dive sites can be reached by motorboat and took time 30 minutes. One of the best dive sites located near Bunaken and Manado Tua. Although you don’t like diving, walking around the beach will be a special and fun experience or taking a look at the Bunaken underwater enchantment maximally with little more cost by Blue Banter submarines.